Avid readers who love wordplay will revel in this new book, which describes a game that began as a family’s holiday pastime and has now evolved into a creative writing method. Book of Decamot is a whopper at over 500 pages, but read the first 20 and you’ll be schooled in the rules of the game and ready to play. 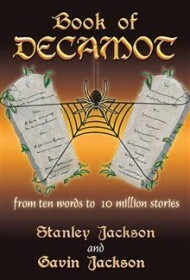 Authors Stanley and Gavin Jackson explain how Decamot started out as a party game with simple rules: The group agrees on ten random words, and each player writes a story that incorporates them all; then each story is read aloud and a winner is determined. That turned into an email exchange and then was formalized into a writing practice. Being English is not a prerequisite to appreciate the writing here, but Anglophiles will love it all the more for the brothers’ style, which references authors Douglas Adams, Will Self, and that British staple, the cryptic crossword. The vast bulk of the book is taken up with finished stories to illustrate how two authors can start with the same words and come up with completely different ideas. The Jackson group—those family members who play together regularly—also revised one winning tale and turned it into a screenplay, which is reproduced here as well. While it’s not necessary to read the whole screenplay to grasp their points, the explanation of scene-crafting and adaptation from a story is so spot-on and useful it could be assigned at the college level. Readers who like wordplay and writers who love the craft will find it hard to read the first few chapters of Book of Decamot without beginning their own list of ten words to work and play with. Do it! And don’t miss this witty and addictive book about a game that’s both intelligent and immensely fun.